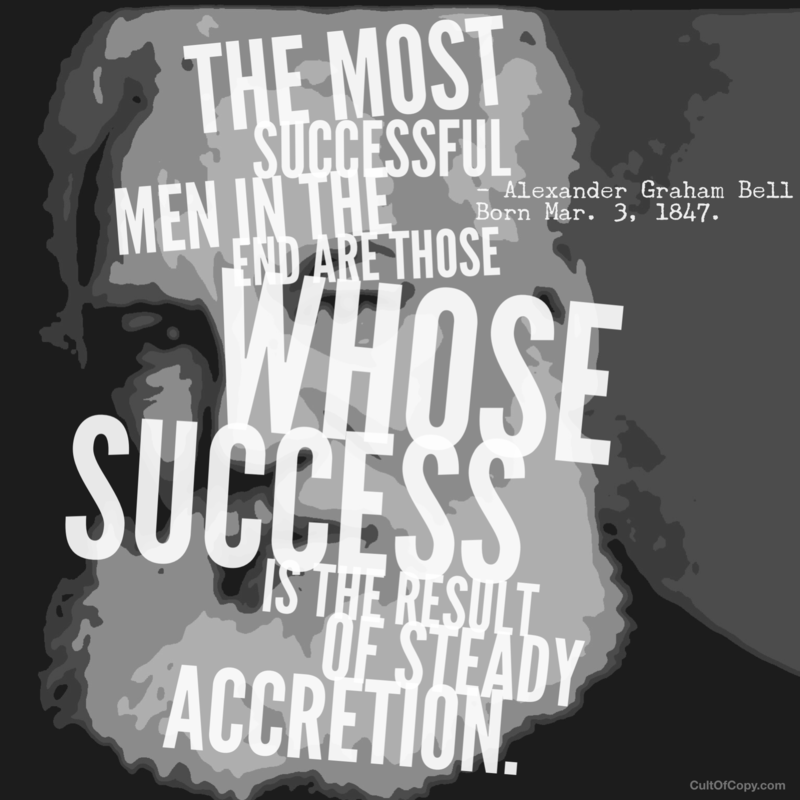 “The most successful men in the end are those whose success is the result of steady accretion.” – Alexander Graham Bell, Born Mar. 3, 1847. Your stuff needs to combine and stack and scale. Too many chase the next client or the next job or the next project. What are you building? Even if you're all service and no products, you're still building a brand. How are you making your ongoing work work for you? To build your rep. To build your portfolio. To build your footprint. To build your list and your reach. To build that bottom line. So today, take a step. Lay a brick. Tomorrow, stick another brick to it. Combine that with the next day's effort. How to know how to work so that the small stuff adds up. How do you make sure things connect and stack and integrate? The secret: start with the end in mind, and break it down into steps you can do in a half day's effort. When you know what each half day is, try to make a piece of content out of it. In other words, do the work, create content telling your audience about creating that piece of work. People will follow, one by one, then by droves. They watch you create the pieces over your shoulder, as it were. Then at the end, when you put it all together, you're assembling rather than creating from scratch, and you've grown an audience already, eager for the whole assembled glory. So if you want your own glorious palace of awesome, you need only place one brick on top of the other, and keep it up.